Cha Tan Yi Wei teapot set in cloth presentation box. This set comprises of a teapot, a multi-function tea tray, and three cups. 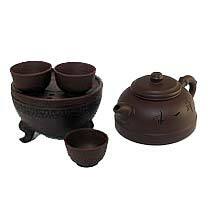 Each item is artfully made from Yixing purple clay. The tray has tiny holes on top to allow excess water to flow beneath the surface during the brewing process. When not in-use, it can be opened up and acts as a storage for the cups, and have your teapot stacks nicely on top of it.